Got called to work on an emergency when a primary server began malfunctioning. Installed updated publishing software (Adobe InDesign) which works great. Still struggling with publication layout due to lack of inspiration. Had nice days out with She Who Must Be Obeyed yesterday and today including a stop in Olmsted Falls and their shopping area full of restored/rehabbed historic buildings. Wrote my first DVD video review for posting on Amazon.com: National Geographic's Five Years on Mars. Tasha's skin disorder –severe itchiness about the head and neck– we thought resolved has relapsed. Depressing. So back to the paying job tomorrow. 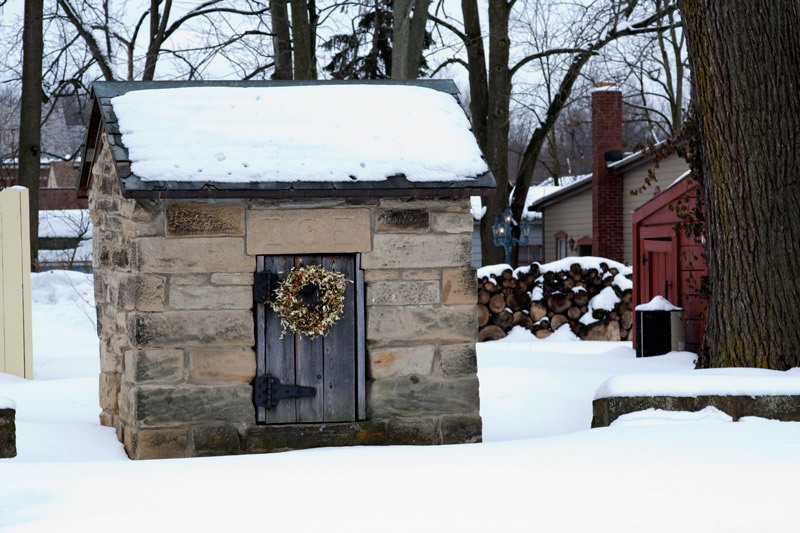 The ice house photo came out well also further proving the new Canon "L" lens is of excellent quality. I am sorry you did not get your project completed. Glad you had a few good days though. I love the ice house and am searching my mind to see if I have ever heard of an ice house before. Sounds like you've been v busy! Love the photo. Cute little place! Thanks, JamesG. That is very interesting about ice houses. I am hoping this week gets better for you!